To begin this tutorial series, we will start off with the basics of setting up the ground environment. As always, before starting with any new game in unity3d, you would Create a New Unity Project, and this is no different. So create one and name it whatever you like. Football Penalty Shootout Game is the first thing that came to my mind, of course, that is too long a name, but hey, that would definitely help me for SEO purpose. Am I sounding greedy? Well, perhaps I do. I'm greedy to spread this tutorial spread as far as possible. And as you know it is the first of it's kind on the internet. Well, back to creating the Football ground then, Create a New Scene and name it as (Penalty Kick Game Scene, maybe. Again? Well, forget it.) whatever you like to call it. You see that you have a Main Camera in your scene. Position the Camera at (0, 1.067563, -6.88631) It is very important that you position it at the same values. Why? Well, we'll see it later. Keep the rest of the Main Camera Transform values as it is. Add a Plane to your scene by going to GameObject->Create Other->Plane. 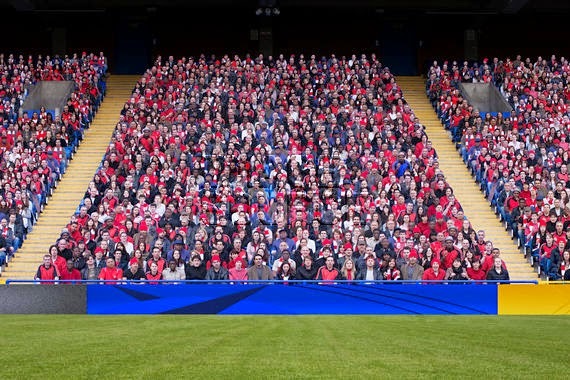 Name it as Crowd. Position it at (-0.001381682, 2.930585, 3.488965). Change the Rotation values to (90, 180, 0). Scale it to (3, 1, 1). Create a New Folder under Assets in the Project panel, name it as Textures. Download the image below and copy it to the Textures folder. Once you have copied this image, it's time to get this image into our scene. 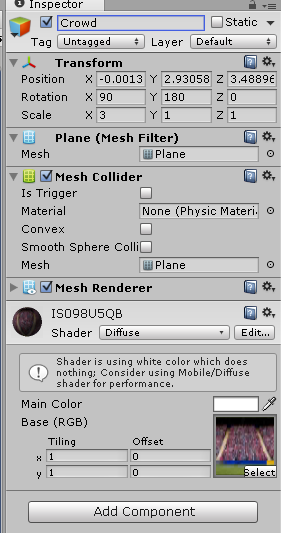 Drag and drop it to the Crowd gameobject, either in the Hierarchy or in the Inspector panel. And now we have our Audience, it is time to set up the Ground. Create another Plane and name it as Ground. Position values are (0.06313723, -0.5, -25.37341). 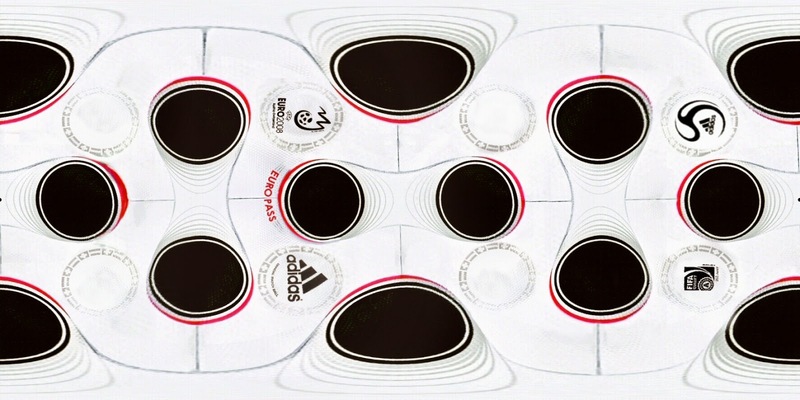 Rotate it as (0, 90, 0). Scale it to (6, 1, 3). Download the Image below and copy it to the Textures folder and drag it onto the Ground, as you did for the Crowd gameobject. Next, we create the Football. Create a Sphere by going to GameObject->Create Other->Sphere. Name it as Football, of course. Position it at (0, -0.3777281, -3.635868). A Scale of (0.25, 0.25, 0.25) would be just about perfect. 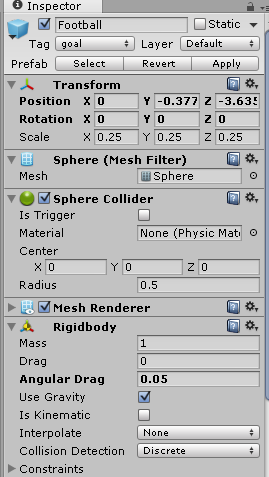 Add a Rigidbody to this sphere by clicking on Add Component->Physics->Rigidbody. 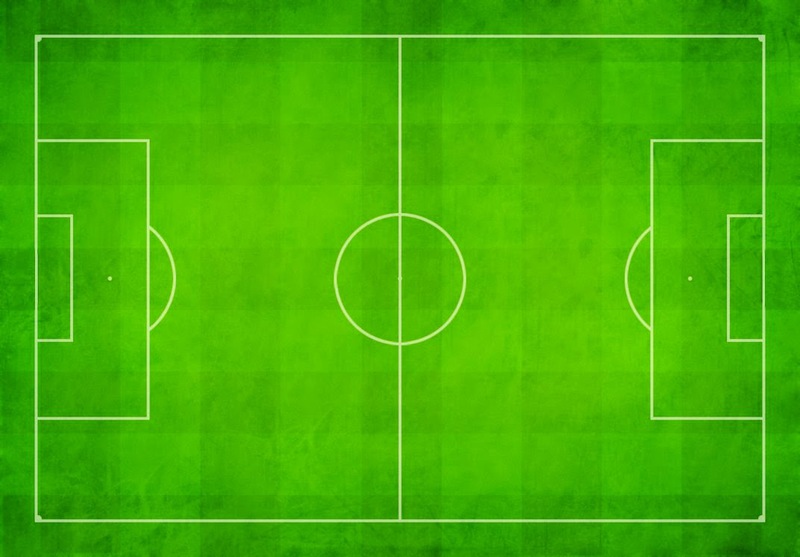 Download the image below and drag it to the Football gameobject. Once you completed this, you have a Super Ground with Awesome Crowd and a Real looking Football. Once downloaded, you can import the package by going to Assets->Import Package->Custom Package and select the file which you downloaded just now. Click on Import afterwards. As you can see in the Image above, we have a Stick Goalkeeper and a quite unrealistic, well it ain't that unrealistic. Is it?, Goalpost. Just drag and drop them into your scene and watch them being place perfectly. You might notice that we have an Animations folder which has some Stick Animations. We will discuss about them later. One more thing to point out is that, on dragging the Keeper onto your scene, you might notice something like in the image below. 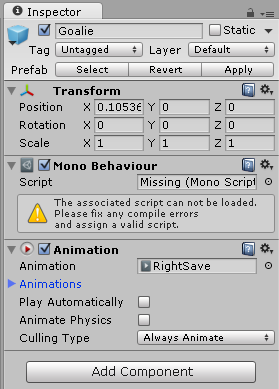 Don't bother much about it, just remove that Mono Behaviour component by clicking on the small Spined Wheel and selecting Remove Component. Hey this is only one part of the game is this it? ?